As you requested, attached please find pictures of my home office with the world map mural installed. I had the room painted blue and white because it reminds me of Santorini, Greece (one of my favorite places I have visited). Not every business can afford penthouse office space overlooking the Chrysler Building. Especially if you're not anywhere near New York City. Anna chose to insert a NYC skyline into this niche and dramatically open up her space with a million dollar view. We can give you any skyline you want or, perhaps, a quiet country scene or tropical landscape. Thought you might enjoy how I used your mural to created my little 'Seaside Bistro'. This is a snapshot of our shed at the camper. A large group of friends gather together for meals and we now have a nice little outdoor prep / serving area! I want to thank you for such a beautiful product. We had a professional paper hanger install the mural behind the baptistry, so it would appear that water is flowing into the Baptistry, and candidates would appear to walk down the river bank into the water for Baptism. It works wonderfully. We ordered the 8' x 12' mirror image (Tamgalla Waters at Sunset) to be sure enough of the water would be positioned to achieve the effect we wanted. We then painted extensions of the landscape on the far left and far right sides of the mural so no one would see a blank wall on either end of the picture. Among the things that impress visitors most in the Ava Gardner Museum are Ava's stunning black gown with 18-inch waist from the movie THE GREAT SINNER (1949) and three walls which are the handiwork of Magic Murals. Customers love restaurants and retailers who are really part of their community. What better way to show that to them than by creating an entire design scheme that celebrates local high school and/or college athletic programs. Want them at your place before, during or after the game? Create a place they'll consider their own. Barbara Krai Interior Design in Tampa Bay did this for a charity event. Can you imagine what she'd do for your home?!?!? Nice work, Barbara. Thanks for letting us be part of the event and thanks for sending us the picture. Thank you. Loving it!' What a cool mural to install in your Living Room Becca! It adds a lot of depth to that part of the room! Thanks for sharing. The murals were not hard to install. We installed one in the dining room--a buffet table will go under this mural, and one in the bathroom. They turned out great! Many thanks.' Thanks for sharing Ben. They turned out wonderful! Flood waters carved these intricate designs into these canyon walls over millions of years. In less than an hour, this homeowner turned millions of years of work into a focal point of his very modern living room. Nice job Benie. ​I had ordered one 6 foot mural to fit a 6 foot wall in my bathroom. Well, then it made the other adjoining walls look 'lost'. So I ordered another 'mirror' image to add to it. I also added some seagulls to it! This is what it ended up like. As you can see from the attached photo, the mural was delivered in good shape and is of high quality. The detail is impressive. The glue on the back worked as advertised. My wife helped me to install the mural (4' x 6') and it really does take two people. The installation wasn't real easy and you have to work at it to get the bubbles out properly but it all turned out well. Some people may prefer to let a professional wallpaper hanger install the mural, although that it not necessary. I am using the 'Tennessee Mountain Stream' mural as a background to my fly rod rack. It is the focal point of my den and the picture I took really doesn't do it justice. Thank you for a great product and great service! The 580 Roller Girls, a charity and community service group, honored their volunteers by creating a custom photo mural commemorating a season full of acts of kindness and acts of absolutely unadulterated aggression. Professional wrestling has nothing on these ladies. Who shall you honor? Our 17' wide Magic Mural definitely sets the stage and makes our Pirate Ship Home Movie Theater really pop! Much thanks for a great job printing this for us! Thanks for Sharing Adam and Alicia--What a great theater room... with a view! Thank you so much for your fantastic product and fast, friendly service. I am currently deployed to Afghanistan from my home in Hawaii. I chose to put up a mural of a beach scene in my office to remind me of home. I get tons of compliments on it and am super happy with it. Thank you so much for the product and even more, for the great service.' Adam -- on behalf of all of us, thank you (and your family) for your service. Dr. Adam's patients get to look at this great ocean scene while they're getting their teeth drilled. Dr. Adam gets to remember the great time he had on vacation; he took this shot himself. Relaxed patient, relaxed dentist -- sounds like a win-win. Make your exam room a winner with a mural that will please everyone. Successful small businesses are always adding new products and services to serve their customers and grow their bottom lines while growing their brands at the same time. A smaller mural is a great way to carve out part of your existing floor plan to launch a new endeavor or house a separate business function. Keep on branding and growing with the aid of our wall solutions; call us today. We're very pleased with the quality of the picture and the ease with which we were able to hang it. The hardest part of my transaction was deciding which mural to order; you have so many beautiful murals to choose from that narrowing it down to one was nearly impossible. Kudos to Aimee for really using her imagination in decorating her soccer fans' bedroom. She used two versions of the same mural to create this wonderful effect: one original and one produced in mirror orientation. One mural; twice the impact! Is there a room where you'd like to create a reflective illusion and visually increase your space? Here is a photo of your mural applied in a small, downstairs kitchenette. The space is quite limited so a more open view could not be obtained. The mural opens up the cramped quarters giving the illusion of sitting at a counter and lookimg out at a Parisienne sidewalk cafe street scene. Very effective. Blossom Falls' is a perfect scene for Alona's alcove. It will bring life to any wall in your home! Thank you for making our dream a reality with an ocean view at the end of our hallway! We made a mistake with our measurements, so we had to paint the bottom of the wall. It looks good, though! As you requested, here are some before and after pictures of my office wall on which we installed the mural. It's beautiful and I've received MANY compliments and inquiries about it. In the restaurant business, sometimes location is more important than the quality of food or service. Location is everything in many businesses. Celebrating your location with vintage maps and images of the city you're in is an easy and inexpensive way of bonding with your customers and displaying your commitment to your community. Call us and we'll find the right maps and images for your location. We've got your covered! No matter your interest or room style, Magic Murals is sure to have the perfect mural for you! Go ahead, browse around. 'The first mural was the Royal Corvette in the small size. I ordered one and also another mirrored. They were trimmed removing the windshield and the top part of the mural. (Otherwise it would have looked like there were two windshields.) I then played with where to match them up. Never could get them quite perfect as you can see by the grille teeth but they are close enough for a garage. I am very happy with how easy these were to install. I did find that the little felt squeegee you send with the murals streaked the finish of the material. Maybe I was rubbing too hard. I ended up doing it with my hand instead. Didn’t have any bubbles to remove. It is a two person job to hang these and I am glad I had my wife to help. 'The second mural is on the other wall of the garage. The bottom of that wall is done in a wainscoting panel that is running horizontally instead of vertically like most would do. There is a shelf just below the mural just 4 inches wide to set a drink on. The idea was to make it look like a window open to the ocean when you look out. I framed the picture using 1x4 rough cut cedar. Is this an eat-in kitchen or winery?! 'I have been looking for a very long time to find the perfect something to put in this space in my house. This is where I keep my orchids. I am so very happy with the way this turned out. Reston Regional Library has their patrons taking a break and relaxing with one of our ColorMe! Murals! - Turned out great! Working with Magic Murals has sparked my creativity to paint on one of the ColorMe! designs. The website was very user friendly, the mural was delivered quicker than expected and the installation was effortless. I love the completed look. Here a photo from one of the murals. Everybody loves it. Our church members love it. The picture doesn't do it justice. Businesses get creative with their spaces with inspiring collages. I made it a one-man operation by taping a 4 foot piece of trim to the front side of the mural, it made hanging very easy. As promised, I am sending along a picture of the downstairs powder room. We have received so many compliments on the mural, and everyone comments about the depth that it gives the room. We couldn't be happier with how it turned out. The new mural is gorgeous and Iﾒve received many positive comments on its quality and beautiful complement to our office! We are a global timber investment company and the map will be a useful tool for our employees and guests. I mounted the three separate 4ﾒx8ﾒ map panels onto three panels of 4ﾒx 8ﾒ ﾽ inch black gator board. This serves to cover up existing paneling and allows us to take the map with us should we ever move our office. The installation was fairly simple and the result is professional-looking. The little felt squeegees are invaluable! I couldn't be happier with my mural. There were so many beautiful options to choose from that it took me awhile to narrow it down to this one. I am convinced that this was the best mural I could have possibly used. It is gorgeous and looks different at different times of day depending on the natural light & lighting. These pictures don't even do it any justice. A model train display that is as real as it gets! I'm really happy with the results. Thanks so much. I purchased a mural from you guys for my public library and installed it at the table where we previously had some coloring sheets. They were such a big hit, we ordered one of these and havenﾒt even had it that long and it is almost finished! Before I discovered MagicMurals, I had gotten a price for an artist to paint a mural on the breezeway wall. As soon as I saw the selection and size options (not to mention a huge price difference), I decided to order. Once the surface was prepared, it took no time at all to install. That was another advantage over an artist painting a mural. The street scene accomplished just what I expected from the outside and inside looking out. A truly inspiring mural - and this customer chose to blend several images from our extensive library to get just the look they were going for. Turned out great! Small Space with a BIG View! Murals make a great way to open a space up! One of my best friends passed away last year and I was recently allowed to have her antique window. It was one of my favorite pieces of hers. I repainted the wood and searched online for a company that had something which would resemble a bit of heaven to stick behind it so that I could picture her there every time I looked at this window. I am so pleased with your company's murals and it fit perfectly behind the window. I have used other wall murals in the past and they are very difficult to separate from the backing, and the material is flimsy. For this particular project I did not apply this mural directly to my wall. I felt that it would be easier to center it to the frame by attaching it behind the window directly and it holds up very well! 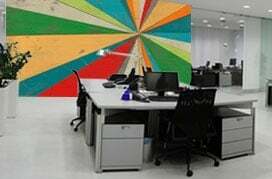 I did notice that the material in your company's murals is a lot more durable and is easy to separate, and for this it would be easier to work with when applying to the wall. Just wanted to show you how the installation came out. We live in the desert SW and this was the image that popped for my wife when I was showing her ideas for the wall. We recently added on. Since I knew we would be doing a mural, I had the construction people finish the wall without texture. It came out great. I installed while she was on a trip and she loves it! It's just a lot of fun. Coming home and rolling into the garage parking place is always delightful. I went on line and found your company. When I called, your customer service was so pleasant, informative and helpful. I was so excited to receive my mural. I couldn't wait to put it up. I live in a split level home. I measured the entire wall above my main entry door. It fits wall to wall, door to ceiling. It makes you feel like you can touch the water. We live in Orange, CA and had not only had a difficult time finding large format art work, but we wanted something that made a statement about where we live. The 'California Oranges' mural fit the need. My wife and I mounted this to 1/4in plywood with a 1x2 wood to thicken the back edges in order to turn this mural into a 'canvas' like thickness. I enjoyed looking at all of the murals on line and ordering was a snap. Their customer service was great. I had a deadline and also had a custom mural made for my small 2 car garage. My painter and I prepared the wall surface smooth and together was able to get the mural up in just an hour or more. We took our time and lined it up just right and removed any small bubbles that may have been in there. I found working with this product was easy and put up the smaller mural in my shop men's restroom myself. My painter added a small trim on the outside which really added the pop! In my shop I wanted a mural that went with my cars so I chose just the right brick. In fact, Debbie in customer service helped me find what I told her on the phone that I wanted, and since it was going to be used in a shop, Debbie made sure that I got just the right one! Murals can transport you to your favorite vacation spot and hobby... take crushing a big wave in Hawaii... are your bags packed yet?! My home office was a much smaller room then in my former house. I ordered the Lahinch golf mural in the large size. I had the opportunity to play this course several times and as an avid golfer, love the Irish courses. The UltraStikﾙ was very easy to put up by myself and I absolutely love it. 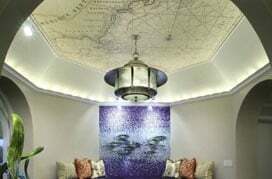 I'm a professional wallcovering installer in the Long Island and NYC metro area. I am 30 years in business and generally work in the high-end residential market. I followed the instructions to the letter. And it came out flawlessly. We were impressed at how quickly the wall paper was delivered to us; and with the customer support who contacted us first to make sure the mural would meet our expectations. Our wall was slightly larger than the largest fixed size offered, and we received samples of the image that had been enhanced in Photoshop for transferring to our specific size: a fourteen plus by ten-foot wall. The wall paper was easily installed by a professional and took less than four hours (one person). The room is the lounge of a multi-generational suite; although, we plan to use it as a game room. Living in Las Vegas, the casino themed wall paper seemed perfect, complete with our card table in the foreground, and our multi-gen room has now become the 'High Roller Suite'. Thank you for such a lovely mandela to color. I bought it for the Parsons Public Library and have had it stationed out where anyone who wanted to participate could get the markers to color it. We love our new office!! I cannot thank you enough for this beautifully done mural. It was the perfect size and fit for our office. I truly appreciate the customization and appreciate the preciseness that went into cutting the mural to the needed size. Several months ago I had a mural done for my basement rec area that would honor my dad who served in Korea during the Korean War. The tiny photo I sent was beautifully enlarged and has been a focal point of my home. Recently my dad was well enough to visit and enjoy the surprise! I'm sending you a picture of the mural itself along with him standing next to it. In the photo he was 18. He is now 85. He sure hasn't changed much from that strapping, young handsome soldier! Here are some images of our mural we recently created. It is on a 13 foot wide curved wall and looks absolutely stunning. We were beyond impressed with the color and quality of the wallpaper. Magic Murals truly delivered on all of our hopes for our office project. We are a county tourism office and this wallpaper represents some of the great things we love about Pasco and the quality of the product helps to show why we do! We have already planned future projects for more custom designs. Love the product. Install seemed difficult on paper but much easier in practice. And my wife and I installed without any argument. What a creative and inspiring nursery! Parents of the year perhaps?! Thanks for your note included with our order. We love the Pensacola Beach mural. We used it in an unusual way for our guestroom. Its so perfect! The pictures included truly can't do it justice. Thanks for sharing Lorinda and Happy Crafting! Need to escape? Perhaps a walk in the woods would do the trick? A mural is the perfect solution to what would have been a boring, uninspiring wall. Now you have a room with a view... for gazing and daydreaming any time you want! Turn any space in to a great escape with a Magic Mural! Just wanted to share with you the Magic Murals installed as promised. Boss is very happy with the outcome and we want to say Thank You very much for the amazing job you guys all did. From the great customer service, to the constant follow-ups, to getting the measurement exactly how we wanted them, to the fantastic job the graphic designer did, to the outstanding outcome of the whole project. Honestly you guys are great. A baptistry backdrop that is truly inspiring. Let our murals help transport you in to space! Ever since I discovered your website three years ago I dreamed of having a mural for the big space in my kindergarten classroom. My budget is very small so I just kept coming back to look at the beautiful murals and hoping the day would come that I could afford one. I subscribed to your newsletter and often returned when you offered discounts to look for the perfect mural but it was so hard to choose! Recently I discovered your clearance pages and you offered an extra discount for Easter so I could not resist making a choice. It still wasn't easy, they are all so awesome! The mural was so easy to hang! When my students arrived on the first morning after it was put up they were thrilled! Here are some of their comments: 'I could look at this all day! ', 'I always wanted this! ', 'This is so cool', 'I love it!'. They named all of the dolphins within an hour! Thanks for the great service and the outstanding product. I am already dreaming of my next mural!!!! We all love it! Thank you! The mural is installed in a corridor. The entire staff is mesmerized as they walk past it. Eye catching! 'I wanted to share a few pictures of our mural from the Calgary show. Things got a bit crazy - there was even a drawing of Godzilla on one of the buildings and a drawing of Trump near the bottom by the end of the weekend, haha! I truly appreciate the great customer service extended to me, when my first scene would not stick (wall cover paste did not activate well). And a second, peel and stick scene, was sent out gratis. A very satisfied customer. There is a blank wall separating my kitchen from my living room. Artwork will not be ideal since it is almost in the hallway where if it is an artwork hanging, it will be accidentally bumped into most of the time - askewing it. Since I live in NYC, I captured the entire beauty of my city - Central Park and all the skyscrapers the eyes could feast for. I'm not a designer but my husband helped and took us less than 30 minutes to install it. We just finished hanging the mural we ordered and we absolutely LOVE IT!. The mural went up with no issues other than operator error a little. Sorry I could not get any better pics but bath is only 5ﾒ x 12ﾒ but is 10ﾒ tall. Thank you for the great mural and overall ease to do business with. Our customers get creative with our murals every day! Take for instance Pamela - transforming a vintage truck hood in to a piece of art -- looks great! A creative an inspiring way to decorate a small space with a theme! I have a cinderblock wall and was concerned about adhesion but the mural seems to be doing well. Thanks for a great product - and a good price. We decided to create an 'office at the beach' when we remodeled our 37 year old room. Since we were applying over orange paisley wallpaper (blame it on the 70's) we followed your advice and primed and sealed it - took two coats but we haven't been haunted by the ghost of paisley past. We purchased the 6' x 4' mural in the hopes it would enhance the small space without being overwhelming. We took design elements from the mural - rough cut untreated exterior siding and rusty iron brackets. We used wood pallets to build side tables and frame the window ledge. We love it. Hope you do too. My son and I finally got some open time together and we installed the mural today. This was my first mural installation so it took a little longer than I had anticipated. The Mural is beautiful and my son was very-very happy with it. Inasmuch as this picture was taken from the 52 floor of a condo it gives my son the feeling that he has moved from his second floor apartment up to the Penthouseﾅ and he likes the feeling. Thank you and all the people at Magic Murals for helping me with this project. A room fit for a King or Queen! I don't know if you've ever had anyone do this, but the wall we needed to put the mural on had a window in it. So we had our installer center the mural on the wall and paint the two sides to match one of the colors on the mural. After she was done, I went in and blended the window frame into the mural and we had a special shade made for the window that has the center of the mural attached to it. We think it came out pretty good. We are very happy with the finished product. We hope you enjoy seeing what we did with it. Let Magic Murals help bring customers in to your business with our special materials, including options for windows and certain exteriors. With 13 foot ceilings in my new apartment, there's 5 feet of white space over the kitchen. My sister suggested a mural of the Houston skyline, and I found the perfect one at magicmurals.com. I think it completely makes the apartment, and can't believe how warm and 'finished' it looks now. Another creative customer - An inspiring living room with props to really enhance the murals in your space!